“The first fire extinguisher of which there is any record was patented in England in 1723 by Ambrose Godfrey, a celebrated chemist at that time. It consisted of a cask of fire-extinguishing liquid containing a pewter chamber of gunpowder. This was connected with a system of fuses which were ignited, exploding the gunpowder and scattering the solution. This device was probably used to a limited extent, as Bradley’s Weekly Messenger for November 7, 1729, refers to its efficiency in stopping a fire in London. The chemical foam extinguisher was invented in 1904 by Aleksandr Loran in Russia, based on his previous invention of fire fighting foam. Loran first used it to extinguish a pan of burning naphtha. It worked and looked similar to the soda-acid type, but the inner parts were slightly different. The main tank contained a solution of sodium bicarbonate in water, whilst the inner container (somewhat larger than the equivalent in a soda-acid unit) contained a solution of aluminium sulphate. When the solutions were mixed, usually by inverting the unit, the two liquids reacted to create a frothy foam, and carbon dioxide gas. The gas expelled the foam in the form of a jet. Although liquorice-root extracts and similar compounds were used as additives (stabilizing the foam by reinforcing the bubble-walls), there was no “foam compound” in these units. The foam was a combination of the products of the chemical reactions: sodium and aluminium salt-gels inflated by the carbon dioxide. Because of this, the foam was discharged directly from the unit, with no need for an aspirating branchpipe (as in newer mechanical foam types). Special versions were made for rough service, and vehicle mounting, known as apparatus of fire department types. Key features were a screw-down stopper that kept the liquids from mixing until it was manually opened, carrying straps, a longer hose, and a shut-off nozzle. Fire department types were often private label versions of major brands, sold by apparatus manufacturers to match their vehicles. Examples are Pirsch, Ward LaFrance, Mack, Seagrave, etc. These types are some of the most collectible extinguishers as they cross into both the apparatus restoration and fire extinguisher areas of interest. Another type of carbon tetrachloride extinguisher was the fire grenade. This consisted of a glass sphere filled with CTC, that was intended to be hurled at the base of a fire (early ones used salt-water, but CTC was more effective). Carbon tetrachloride was suitable for liquid and electrical fires and the extinguishers were fitted to motor vehicles. Carbon tetrachloride extinguishers were withdrawn in the 1950s because of the chemical’s toxicity – exposure to high concentrations damages the nervous system and internal organs. Additionally, when used on a fire, the heat can convert CTC to phosgene gas,formerly used as a chemical weapon. The carbon dioxide (CO2) extinguisher was invented (at least in the US) by the Walter Kidde Company in 1924 in response to Bell Telephone’s request for an electrically non-conductive chemical for extinguishing the previously difficult-to-extinguish fires in telephone switchboards. It consisted of a tall metal cylinder containing 7.5 pounds (3.4 kg) of CO2 with a wheel valve and a woven brass, cotton covered hose, with a composite funnel-like horn as a nozzle. CO2 is still popular today as it is an ozone-friendly clean agent and is used heavily in film and television production to extinguish burning stuntmen. Carbon dioxide extinguishes fire mainly by displacing oxygen. It was once thought that it worked by cooling, although this effect on most fires is negligible. This characteristic is well known and has led to the widespread misuse of carbon dioxide extinguishers to rapidly cool beverages, especially beer. In 1928, DuGas (later bought by ANSUL) came out with a cartridge-operated dry chemical extinguisher, which used sodium bicarbonate specially treated with chemicals to render it free-flowing and moisture-resistant. It consisted of a copper cylinder with an internal CO2cartridge. The operator turned a wheel valve on top to puncture the cartridge and squeezed a lever on the valve at the end of the hose to discharge the chemical. 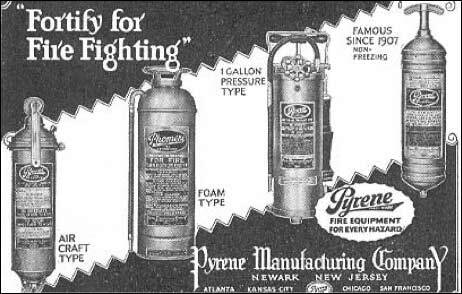 This was the first agent available for large-scale three-dimensional liquid and pressurized gas fires, and was but remained largely a specialty type until the 1950s, when small dry chemical units were marketed for home use. ABC dry chemical came over from Europe in the 1950s, with Super-K being invented in the early 60s and Purple-K being developed by the US Navy in the late 1960s. Manually applied dry agents such as graphite for class D (metal) fires had existed since WWII, but it wasn’t until 1949 that Ansul introduced a pressurized extinguisher using an external CO2 cartridge to discharge the agent. 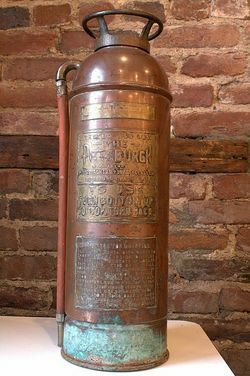 Met-L-X (sodium chloride) was the first extinguisher developed in the US, with graphite, copper, and several other types being developed later. There is no all-encompassing fire code in the United States. Generally, most municipalities (by adoption of the International Fire Code) require inspections every 30 days to ensure the unit is pressurized and unobstructed (done by an employee of the facility) and an annual inspection by a qualified technician. Hydrostatic pressure testing for all types of extinguishers is also required, generally every five years for water and CO2 models up to every 12 years for dry chemical models. Recently the National Fire Protection Association and ICC voted to allow for the elimination of the 30-day inspection requirement so long as the fire extinguisher is monitored electronically. According to NFPA, the system must provide record keeping in the form of an electronic event log at the control panel. The system must also constantly monitor an extinguisher’s physical presence, internal pressure and whether an obstruction exists that could prevent ready access. In the event that any of the above conditions are found, the system must send an alert to officials so they can immediately rectify the situation. Electronic monitoring can be wired or wireless. The extinguisher is emptied of its chemical and pressure to check for proper operation. All components are disassembled, inspected, cleaned, lubricated, or replaced if defective. Liquid agents are replaced at this time, dry agents may be re-used if in good condition, halon is recovered and re-used, but CO2 is discharged into the atmosphere. The extinguisher is then re-filled and recharged, after a “verification of service” collar is placed around the cylinder neck. It is impossible to properly install or remove a collar without depressurizing the extinguisher. Hydrostatic testing: Water, foam, wet chemical, and CO2, every 5 years. Dry chemical, dry powder, halon, and clean agents, every 12 years.